In April and May, birds such as the Baltimore oriole, wood thrush and eastern phoebe migrate north along the Atlantic Coast Flyway and land in Central Park to feed. 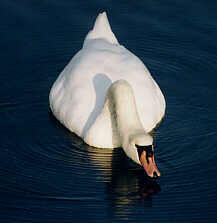 Many birds use Central Park as their summer breeding grounds such as the pair of Mute swans that raise their baby swans or cygnets on the Lake. April through August birds nest and raise their young. 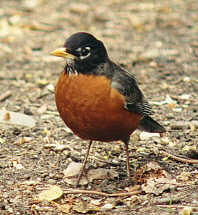 Look for song birds such as the baby American robin, northern cardinal and European starlings who follow their parents "peeping" and lowering their wings in begging postures. Look for baby waterfowl such as mute swan cygnets, and mallard ducklings who follow their parents single file across the meer, the lake or the ponds in Central Park. A pair of Red-tailed hawks built their nest and raised their young on a Fifth Avenue building. Other red-tails hunt and soar over Riverside Park. When the honeysuckle and other flowering plants bloom look for ruby throated hummingbirds sipping nectar from the wildflowers. In September many of our songbirds that feed on insects, such as American redstarts, scarlet tanagers and red breasted grosbeaks, migrate to warmer areas, where food is plentiful. Waterfowl, such as the belted kingfisher , that depend on aquatic insects, fish, amphibians or aquatic vegetation also migrate south looking for open water on which to feed. A number of songbirds such as white-throated sparrows, tufted titmice, juncos, house sparrows, starlings, blue jays, and cardinals either come down from more northern climes to feed on tree seeds in the park, or live in our parks year-round. In Central Park, the bird feeders at Azalea Pond in the Ramble are stocked with bird seed throughout the winter. People who love birds will often put seed out for them under street trees or in back yards throughout this season of ice and snow. If the winter isn't too cold and the park ponds, lakes and rivers don't freeze you can find a number of waterfowl like Canada geese and mallard ducklings. Walk quietly up to tree or ground where bird song or sound is coming from. Dont go too close or the bird will fly away. The Harlem Meer, especially during the winters that it does not freeze, attracts waterfowl year round. When this body of fresh water was rebuilt in l993, it was stocked with thousands of fish. The fishing and diving birds such as Cormorants, Great White Egret, Black-Crowned Night Heron and numerous ducks, geese and swans come to the Harlem Meer to feed, nest and raise their young during the different seasons. Few people know about or have been to this idyllic body of water that stretches from l00th Street to l03rd Street along Central Park West. The pool drains eastward, through a series of waterfalls, and then it turns into the Ravine, a creek that meanders into the Harlem Meer. The Pool has numerous fish and attracts all kinds of waterfowl during the warm months. The Ravine is quite shallow in places, and songbirds enjoy bathing in it during the spring and summer. There are also fish, tadpoles and crayfish for the fishing birds to feed on. Azalea Pond in The Ramble has numerous bird feeders which are stocked throughout the year, so that the birds always have food-- even in the seasons of ice and snow. The Ramble itself, which has diverse habitats: woods, meadows and water (Azalea Pond and The Lake), attracts many birds year round. 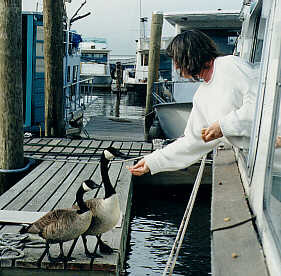 Many residents of the 79th Street Boat Basin feed the birds year round. There are several people who live or work on the Upper West Side that come down to the river on a daily basis to feed the birds. During the severe winters of l994 and l996 when the river iced up, waterfowl congregated at the marina by the hundreds in response to winter feeding and protection. Because of the numbers of birds that live in or around the marina, one can frequently see birds of prey such as the Red-Tailed Hawk and the American Kestrel.